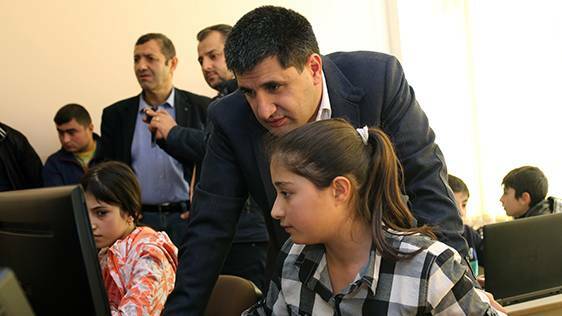 Recently, Hayk Yesayan, the Director General at Ucom, has visited the students of “Armath” engineering laboratory, operating in the rural school of Nerkin Karmiraghbyur community in Tavush region. With the support of Ucom, the laboratory was opened 2 years ago in this school, which is immediately under the fire of the enemy. If two years ago the lessons of young engineers and programmers were being held in a psychologically strained environment, now the situation is different, as the school is protected with a 3m high protective wall, which allows children to feel safer and concentrate on the learning process. Nevertheless, the feeling of everyday danger hinders these children from understanding clearly how to apply their school knowledge in future.